After a nice weekend upward move over $700, bitcoin retreated from those gains and has found some tough resistance at the $680 level. Current levels point towards a period of consolidation prior to the halving of the bitcoin miner reward, set to happen in the next few days. The chart above shows the hard line of resistance that has formed at the $680 level. Both times it was approached resistance held firm and sent the price retreating. During the next 24 hours, price should see a Mickey Mouse Bounce House consolidation into the $645-$655 levels. Signs remain bullish after that consolidation as the trend line suggests support here will form prior to a move towards the upside. 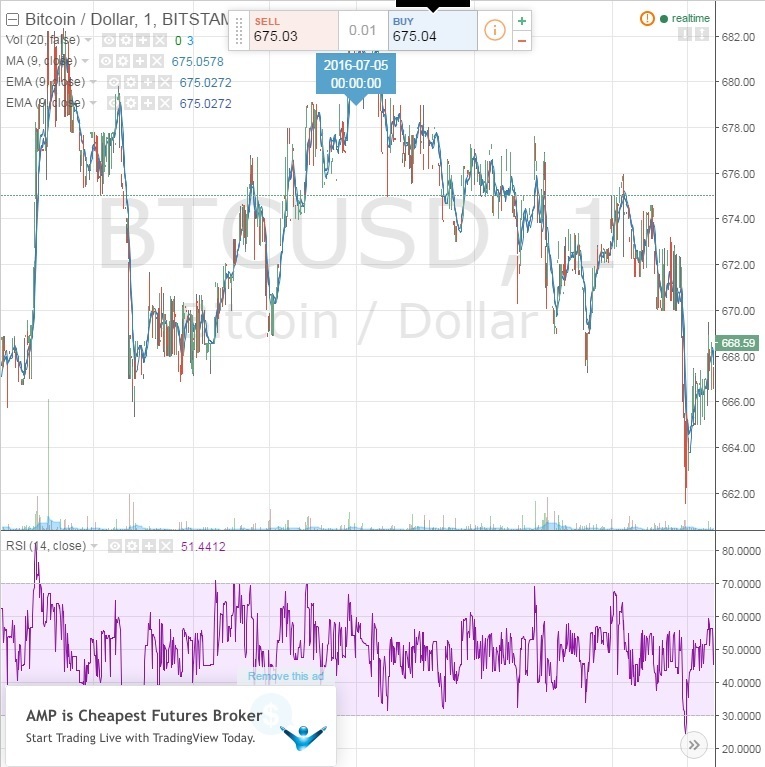 Bearish conditions could result from traders deciding to reduce their positions following the year long rally bitcoin has enjoyed. Should this occur, the previously mentioned $645 resistance level is followed by resistance levels at $625, $610, and $600. Any sustained retreat in price should be stabilized at the $550 to $560 level, where major resistance was found last time. RSI continues to be the best day trade indicator. Looking at the chart above, the pattern of RSI reaching 70 followed by a price drop is seen repeatedly. On the opposite side, anytime RSI approaches or goes below 30 a price rebound immediately follows. Day traders should look to buy in when these two levels are approached, looking particularly at an RSI of 65 as a buy level for short positions and an RSI of 35 as a buy position for long positions. Profits should be taken in the 10–20% range immediately when the correction takes place. While the pattern is established and has been for almost two weeks there is still a lot of variance in levels of correction so do not hesitate to take the profit. Technicals do not point towards a major decline in any sense. While bitcoin has a lot of upside momentum and news, extended rallies are very hard to sustain because they require a lot of buying power. The market turmoil caused by Brexit has been quickly corrected, meaning there is little chance of a major spike in bitcoin safe asset interest in the short term. Traders can and should look to take advantage of the established RSI pattern and take quick profit while it is available. Be sure to establish tight stop losses as well when initiating these very short term trades to protect yourself from a sustained price drop.